Pandan extract gives this traditional Vietnamese cake a vibrant, green hue. For March’s green-themed Supper Club dinner, Dino was eager to try out an interesting recipe he obtained from one of his coworkers. Bánh Bò Nướng is a Vietnamese dessert in which extract from pandan leaves gives it a rich, green hue. The word “honeycomb” in this case comes from the fact that when the cake is sliced open, it looks like the texture of a honeycomb. The key to creating this texture is a mix of tapioca flour (AKA tapioca starch) and single-acting baking powder. We learned that the most popular and regularly available baking powder in the USA is double-acting, meaning that it has one reaction when mixed with wet ingredients and a second reaction when exposed to heat. Single-acting baking powder only reacts with wet ingredients, so it’s key that you seek it out if you want to make this recipe at home. Apparently the use of double-acting baking powder will cause a huge, gummy mess. I found Dr. Oetker’s Original Baking Powder at our local Stop & Shop, which is a single-acting, German baking powder. Dino’s coworker, Gina, recommended that we use buko pandan flavor extract. Buko refers to young coconut- and so the bottle we used was a mixture of young coconut and pandan flavoring. Gina has been perfecting this recipe for years, so we trust her! This cake is not a typical dessert by any means. It has a spongy texture and is not overly sweet. Pandan itself has a rich, nutty and grassy flavor which works very well with the coconut milk and young coconut flavoring. To me, the taste was reminiscent of marzipan. It certainly fit the bill for our green-themed dinner, and it got a big reaction when sliced open due to its interesting texture and vibrant, green color. If we make this cake again, we would seek out pure pandan extract without the young coconut flavor and artificial ingredients to see how it differed from this version. This would be a fun dessert to serve at a Halloween party with a chocolatey glaze- the dark color of the chocolate with the bright green would be wicked good fun! 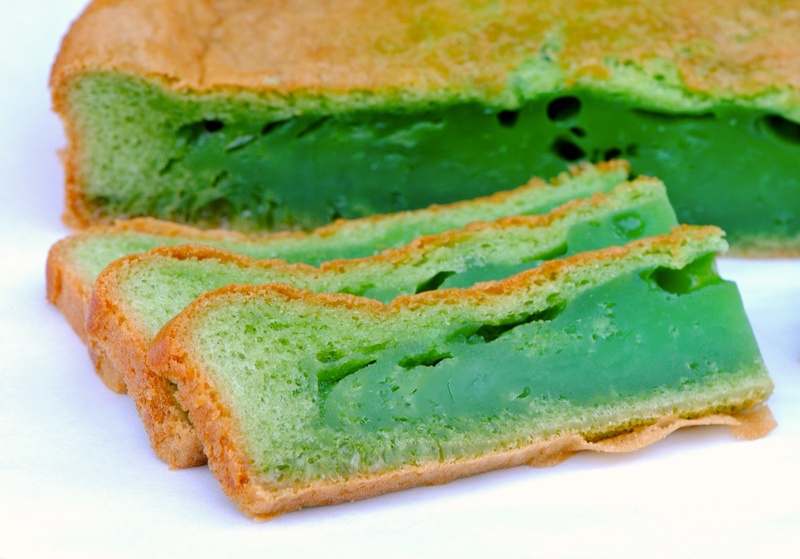 Pandan extract gives this traditional Vietnamese cake a vibrant green hue. 1. In a sauce pan over low heat, add the 1/2 can of coconut milk and the 1 cup sugar. You’re basically just melting the sugar here so it will only take a few minutes. Turn the heat off then add the Buko Pandan flavoring. I usually put about 1/3 of the small bottle, but it all depends on how much flavoring you want your cake to have. To me, 1/3 – 1/2 is just perfect. 2. Let stand for about 10-15 minutes or whenever it totally cooled down. 3. Preheat the oven at 350 degrees for about 15 minutes. 4. In a mixing bowl, whisk the 6 eggs (don’t over beat the eggs). 5. When the coconut milk/sugar mixture is completely cool, mix this to the beaten eggs along with the 2 cups of tapioca flour + 2 1/2 teaspoon of single acting baking powder. Again, don’t over mix. The consistency should be watery. **I guess this will depend on your oven. I followed instructions in the past to bake it 50-60min and I noticed that the ends end up being way too dry while the inside is moist and chewy. So I started to experiment and lessened baking time, making the entire cake moist and chewy with no dry ends (of course if you prefer the first, you can bake longer so it’s up to your preference). Wonderful cake, thanks for sharing! This is fascinating. I wonder what single acting baking powder is. Will have to find out. Love the colour and structure. panda is one of the many things I’d love to get my hands on. The most popular and regularly available baking powder in the USA is double-acting, meaning that it has one reaction when mixed with wet ingredients and a second reaction when exposed to heat. Single-acting baking powder only reacts with wet ingredients. We had some single-acting baking powder left over from making this cake. I used some to make buttermilk pancakes and they turned out really well. They were less fluffy than they usually turn out, but in this case it was a good thing. OMG yes! Those pancakes rocked our world! I bet this is just delicious and it looks so fun! That bright green color looks like it belongs in a Dr. Seuss book – too fun!!! Oh man – it’s TOTALLY Seussian. Seussesque? Seussy. Ha! I LOVE the crazy green hue!! And the texture!! What a cool cake. That’s so cool – the friend who came up with this recipe is actually from the Philippines, too! Are Vietnamese desserts big over there, or just pandan goodies? Now I’m going to have to see if I can find Pandan. i don’t think I’ve seen it anywhere in San Antonio so far. Amazon, perhaps? Definitely Amazon, but it’ll cost a lot more than if you can find it in store. Do you have any Asian markets in the area? That would be a pretty good bet! That color is just wild. I think I’ll have to try this out of sheer curiosity! Right? It totally fit the bill for our GREEN themed dinner! I think I messed up somewhere. I used a Pandan extract at 30ml and my cake turned brown. Not sure what happened. Also it collapsed but maybe my oven was too cold or it was too oily? I used coconut oil in a bundt pan. Hmm – the recipe calls for about 1/3 of a 20mL bottle of Buko Pandan flavoring, so 30mL would be too much. I know that the pandan flavoring is different than extract, which may be the reason for the color change. Also, did you find single acting baking powder? If you used double acting (which is what’s standard here in the US), that may have caused issues with it not rising properly. Sorry to hear that you had trouble with it!